We are part way through the last day of 2012, and counting down the hours to 2013, a year that has tremendous meaning to us. Before we can appropriately make the transition to 2013, we honor the events of 2012 by reflecting back on an incredible year! The first half of 2012 was spent working on the book and making cakes for clients, with little to no social time to spend with our family and friends. We knew the demands of writing the book would be high as we went through editing and a final photo shoot, and had scheduled any work-related traveling for classes starting in June, as book commitments would be winding down. As soon as June arrived, that is when our traveling really started, and it felt like we were always getting ready to fly for a trip, or just returning from one. In 2012, we logged 50,700 miles, approximately, and all but 5400 of the miles occurred in the last 6 months of the year! Those 50,700 miles pulled us away from home for weeks at a time, and on a few occasions, left us with only a couple weeks between trips. We flew to foreign countries that we have dreamed about visiting our whole lives and took in as many new adventures as we could handle. In the fall, we met our publishing team at Clarkson Potter in New York City. Arriving at the Random House building and getting to meet the many special people involved with Extreme Cakeovers was exhilarating and easily one of the highlights of our year! The weeks between trips were spent getting over jet-lag, making cakes, working on final touches on the book, and trying to stay sane! As crazy as life got, we wouldn't trade the experiences and memories we had for anything and feel grateful to all of Rick's students and hosts who have supported him sharing his craft around the world. We met cake friends from all over the world who will be in our lives for years to come. 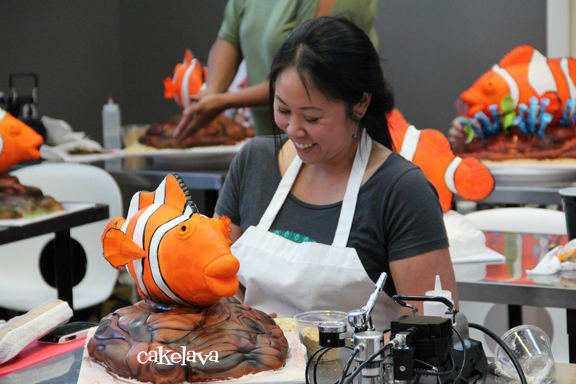 Rick taught 8 classes of his "Discover Your Inner Artist" series, and by the end of the year, there were a lot of students with beautiful clownfish and hibiscus cakes and hundreds of photos to document the experience. The traveling experiences were unforgettable but the schedule was pretty excruciating to maintain and after our last trip of the year, we were anxious to enjoy some down time before our next flight. Our traveling is far from over. We have more scheduled trips and new classes for 2013, which we are really looking forward to! 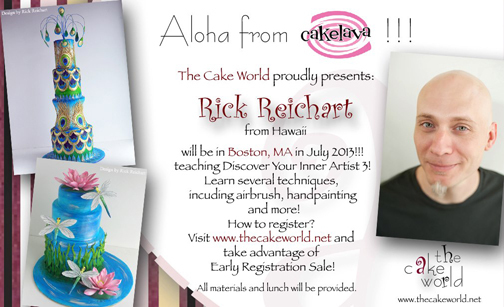 In 2013, Rick will be debuting his "Discover Your Inner Artist 3" two-day classes, starting in Austin, Texas, in conjunction with the cake show "That Takes the Cake", and ending in Boston, Massachusetts, shortly before our book's release. For a list of Rick's classes, please visit the "Classes" page at the top of our blog. In addition to the classes and the book's release, we will be busy making cakes. 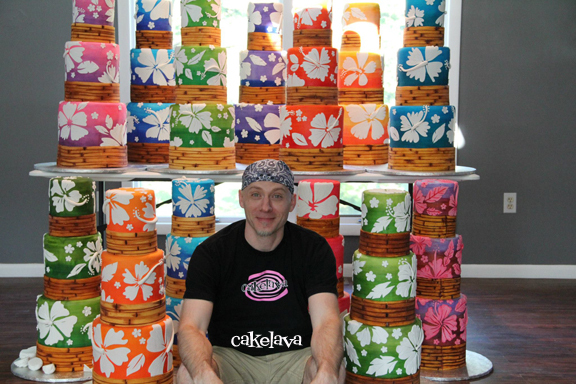 Rick has designed some amazing cakes for clients in 2013, starting just days after the new year! 2013 will be the year we finally get to make the transition from "writing a book" to "published author" and we couldn't be more excited about the release of our literary "baby", Extreme Cakeovers in the Summer! We have put our heart and soul into this book, ever since it was purchased in 2011. We probably lost a few years of our lives in the process of doing the book and had many near-sleepless nights because we were unbelievably excited, or stressed, or a little of both. We can't wait to present more content from the book once we are able to and will post information on the blog, website and social media as it becomes available. Stay tuned! Finally, we want to thank everyone who has supported us this year and wish you all much happiness and success in 2013! The 2001 Dodge Ram 2500 Diesel is a BIG truck. Occasionally we have one of these massive vehicles in our shop parking lot, and I watch in awe as the driver maneuvers this huge piece of machinery into a parking space better suited for a compact car. They almost always back in, which is a feat in itself. If you have seen our parking lot, you know what I'm talking about. 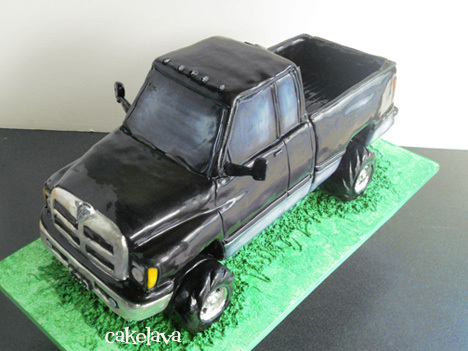 Weve been eyeing the Dodge Ram trucks for a while now, knowing that Rick would have to sculpt one of out of cake for a client of ours who was gifting the cake to her son. Making this huge truck was a BIG deal for Rick because the client and her husband were also close friends of ours, and we would be attending the party as guests. The sculpted 2001 Dodge Ram was made for a holiday celebration on the same weekend that Rick did the sculpted dragon wedding cake , and another art cake, so his plate was very full! 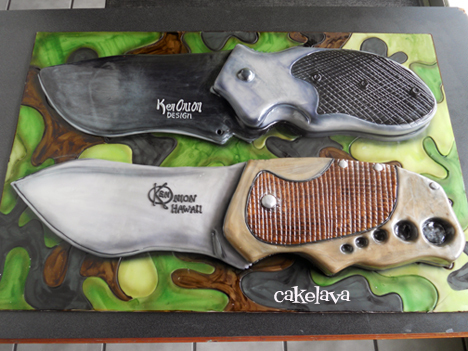 The cake was ordered in honor of our client's sons, who had flown to Hawaii to spend the holidays with family. It was a lovely dinner party with the perfect mix of their family members and close friends and, is often the case, some of our other clients who have previously ordered cakes were there as well. No pressure there! The owner of the truck was thrilled with his edible gift, and very happy with his mother's choice of Guava cake, as were the guests. One of the guests happened to be a truck enthusiast and complimented Rick on how spot-on all the details of the Dodge Ram were and basically, everything was where it was supposed to be. That meant a lot to us, as we are far from truck experts and Rick did his best to pick up on the nuances that would best translate the cake into a recognizable Dodge Ram. The clients were happy. Guests were happy. Our previous clients were happy. We were ecstatic because everyone was so happy (including the truck enthusiasts)! Cake tasted great. Mission accomplished! In case we don't blog again before 2013, we want to wish everyone a Happy New Year. 2013 will be an incredible year. Bring it on!!! Around this time of year, people ask if we are busy making Christmas cakes, and the answer is usually "no", which often comes as a surprise to them. The weekend before Christmas is busy, but not with holiday themed cakes because the wedding and birthday cake clients book those dates in advance, leaving no availability for holiday requests. The cakes made for last weekend were ordered in the Summer, within about two weeks of each other, and none had a Christmas theme. The cake above was made for Taryn and Sean's wedding. This couple was a dream to work with! They were enthusiastic about the design process and we were excited about their design - a dragon cake - which Rick couldn't wait to make! It was something he and I would look forward to coming back to, after nearly a month of traveling. It wouldn't be the easiest cake to return home to, but certainly a satisfying one! 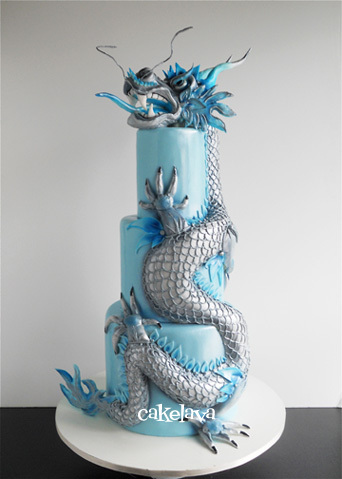 Rick sculpted the dragon out of cake and had it climbing up the cake tiers. He used the couple's wedding colors of blues and silver, with accents of black and white. The head of the dragon was the most difficult and time consuming part of the cake. It would be the focal point of the cake and Rick spent a good seven or eight hours just on the head between sculpting and painting it. It was very detailed and looked amazing in person! We couldn't wait to show it to Taryn and Sean. The delivery of the cake to their Waikiki hotel was quite memorable. The couple had arranged with us in advance to be photographed with them and the cake. When they entered the room, I saw their jaws drop upon seeing their cake and immediately rushed over to get a better view. They were beaming with excitement and told us how important this cake was to them. It is reactions like this that made all the hard work and time spent on making their dragon as perfect as possible, all worth it! We felt great the rest of the day. Congratulations to Taryn and Sean, and thank you for making our first weekend of cakes after a long trip completely worth the wait! Our mouths dropped open when we saw our clients Lily and Leon's wedding cake photo taken by their photographer Eric from L'amour Photography. Everything about this wedding was stunning - the location at the Oceanfront Oasis Estate, the exquisite floral design by Yvonne Design , the gorgeous couple, and an ombre lilac cake that matched their colors and theme beautifully! We have many wedding clients who book over a year in advance, but this bride came to us with far less time to design the cake. We had to work quickly, and she was so sweet, enthusiastic, and accommodating. She expressed her vision to us and gave us a range of lilacs to use on the cake. We presented her with an idea that Rick had, she loved it, and off we went! 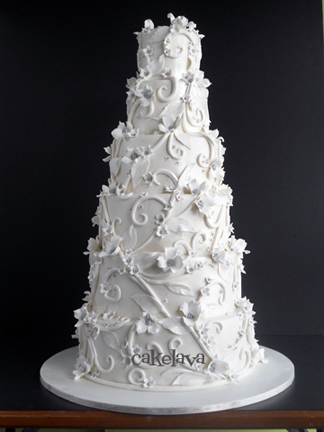 The oversize flower with its many delicate petals was handcrafted by Rick, and the cake had an all over shimmery tone. 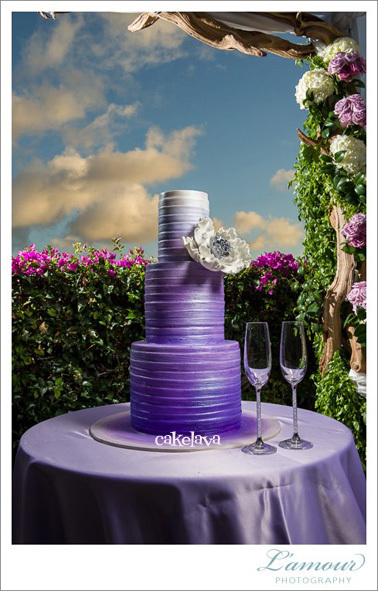 When we arrived at the site and the cake was placed on the lilac linen, we were impressed at how well the colors matched both the linen and the floral arrangements. Eric, the couple's photographer commented that it was "a perfect ombre", and that was great to hear! Even the bougainvillea on the grounds of the estate looked like they were placed there just for the wedding. Congratulations to Lily and Leon on their marriage, and to L'amour Photography for sharing the photo! We have a special place in our hearts for clients who return repeatedly for their celebrations. Rick made a "Nightmare Before Christmas" themed cake for our client's son, a cake for her parent's anniversary, and this year, a Shadow and Sonic the hedgehog cake for her other son Hayden. We were asked to have the character Shadow on the cake, because it was Hayden's favorite, and also to include the "chaos" emeralds. As our client placed the order, I immediately thought "What are chaos emeralds"? I wasn't the only one because Rick turned to the internet to find out what they looked like in order to make them. Ah, diamonds! An internet search has saved us many times after we have said to the client, "Sure, no problem. We can do that!" 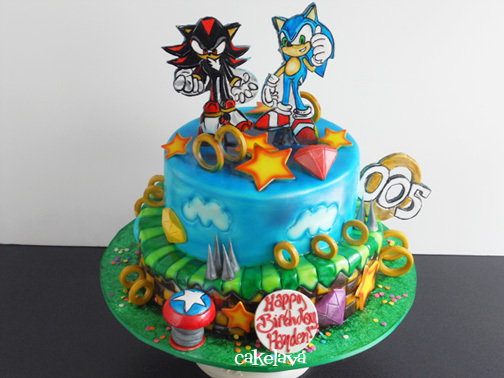 Rick put both Shadow, the darker character and Sonic on the cake. They paired up well and added a nice contrast. We love the whimsical theme of Shadow and Sonic. 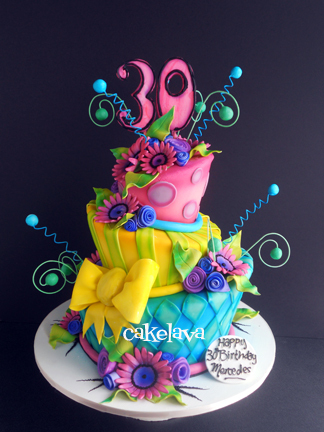 Their world is full of color and translated well onto cake. It was the perfect canvas for Rick to let his creativity run wild and he made an eye-catching design that came to life as each hand made piece was placed. The flavor of the cake was Kona Toffee Crunch with chocolate cake. Caffeine, toffee pieces, chocolate, and a supercharged, colorful design. 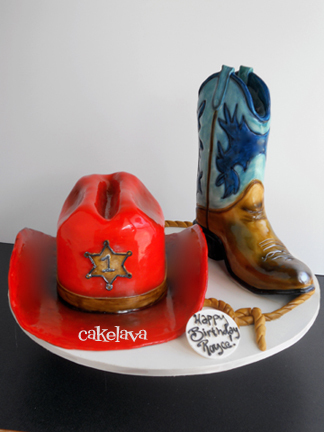 Now, that's our kind of cake! 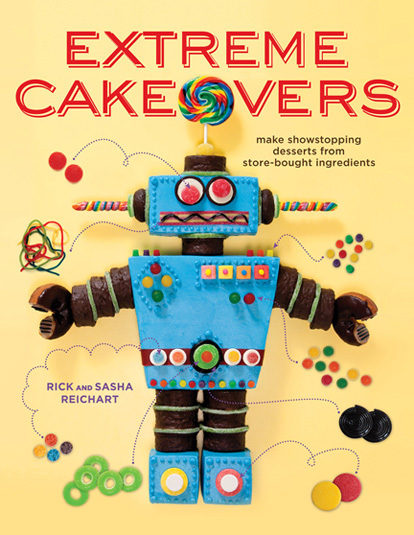 Having spent the past year and a half working on our book, EXTREME CAKEOVERS, it was truly exhilarating for Rick and I to see the cover design! He and I have had many discussions about the cover of our book, wondering which cake or cakes would be given the honor to be front and center, or would there even be a cake? As you can imagine, we have grown quite attached to all the cakes in the book and found it difficult to choose just one for the cover. As fate would have it, we didn't have to, because the decision was made for us. It was the Robot cake's lucky day - his chance to shine and show what he's made of, quite literally! When we saw the cover, we fell head over heels all over again with the cute little robot we spent so much time crafting and writing about, and were in awe with our book designer's brilliant composition that so perfectly captured what the book is about. Although the robot cake is a perfect cover model, we are just as excited about the dozens of other cakes that Rick designed for the book and look forward to the day when we can share them with you! EXTREME CAKEOVERS will be released next Summer by Clarkson Potter (Crown Publishing/Random House). It has been a huge honor for us to work with our wonderful editor and publishing team at Clarkson Potter and feel blessed to have the opportunity to write such a fun book! 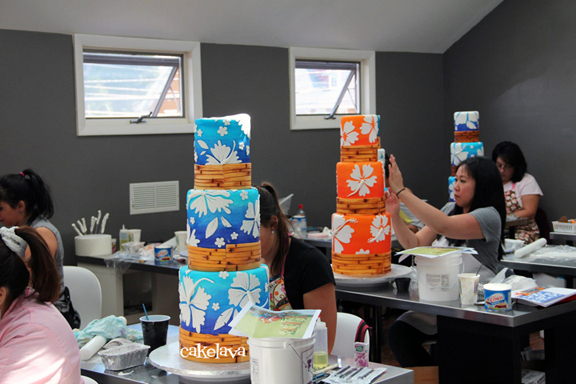 BOSTON, Massachusetts "Discover Your Inner Artist 3" classes at The Cake World! 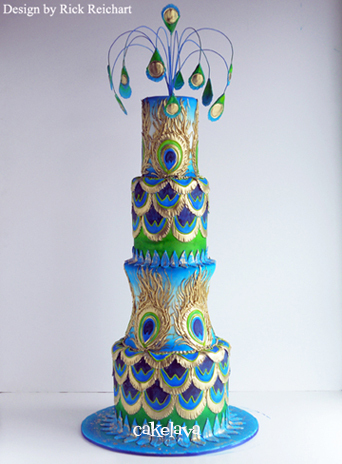 We are thrilled to announce our third and final set of "Discover Your Inner Artist 3" classes for 2013, which will take place at The Cake World in Boston, Massachusetts in July. This will be the first time Rick is teaching his craft in New England, and the only North American east coast location in 2013. Due to our book's release in Summer 2013 we will not be traveling for classes past July, so if you have been wanting to learn from Rick, we would love to have you join us at one of our three scheduled locations next year - Austin, Amsterdam and Boston. The philosphy behind Rick's "Discover Your Inner Artist" series of classes is to teach students how to let go of their artistic inhibitions and dependence on fancy tools, molds and cutters and learn how to trust their own "inner artist", which we all have. 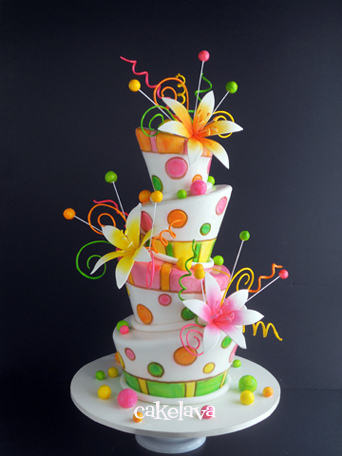 The classes explore some of his favorite art techniques and take a free form artistic approach to cake decorating, promoting creativity by embracing the idea of letting go and not feeling like you need to achieve such a precise or uniform look to cakes. Rick often says "It will work itself out". Once you have the knowlege of many different techniques, your confidence as an artist builds and you take more risks with your work, giving you more means to an end. We've had great success with "Discover Your Inner Artist" and "Discover Your Inner Artist 2", with students expressing they haven't tried many of these techniques before. Students who have taken either or both DYIA and DYIA 2 will already be familiar with some of the techniques and can jump right in to learn these designs, which are slightly more involved. However, the first two series of classes are not a pre-requisite to "Discover Your Inner Artist 3" classes. 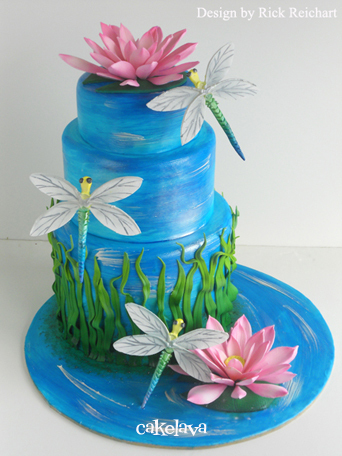 Students who enroll in the Peacock and Dragonflies and Waterlillies 2-day classes will learn handpainting, airbrushing skills, fondant application on taller tiers, including a concave design, how to pipe with royal icing, how to create a custom waterfall-style cake topper, and how to make handcrafted decorations without the use of molds or fancy cutters. To register, visit here. 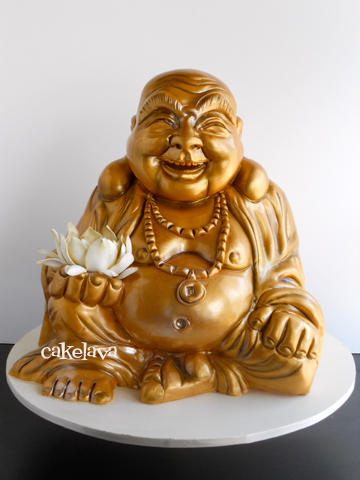 The Cake World is offering a 10% early registration discount until November 20th. Students may either pay in full or in installments. 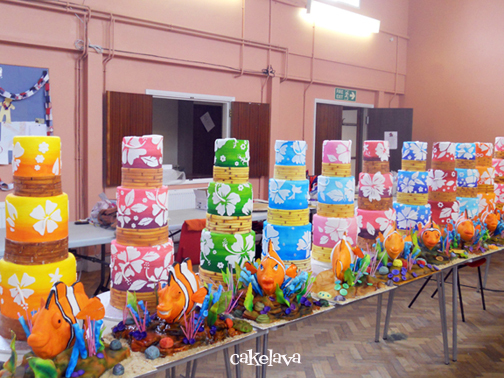 Please contact The Cake World with any questions about the class or for travel information. There will be a limited number of openings in each class, to allow Rick to give students more individualized attention. We hope to see you there! It has been two months since our last blog post, and what a crazy two months it has been! In early August, our book "Extreme Cakeovers" was launched in-house by our publisher, Clarkson Potter and shared on their blog, The Recipe Club. Three times a year, about a year in advance of the book's release date, Clarkson Potter editors share the projects they have been working on with in-house editors and their marketing and sales team. "Extreme Cakeovers" is due to be released in Summer 2013, so it was our book's turn to be featured! We were very proud to on Clarkson Potter's Cookbooks for Summer 2013 list and so excited when we found out who the other authors were -- some of the best in the industry! Our editor Ashley, who has been so wonderful throughout the process actually made one of the cakes in the book that she brought to the launch with her. It was the Marketing Director's birthday and she loved her jukebox cake. Knowing that our editor who is not an experienced cake decorator, was able to recreate the cake Rick designed was special and absolutely thrilling to us. We heard the cake was a huge hit and only made us more excited for 2013! It was the first time the public was given a sneak-peek at the cake cookbook we have been working on for over a year, and we were thrilled to put it out there! 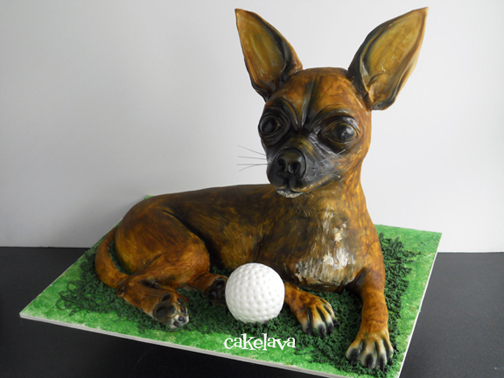 We surprised many people who were expecting an advanced cake decorating how-to book, when it fact, "Extreme Cakeovers" is a cake cookbook that anyone can pick up and use, not just professional cake decorators. We will post more on "Extreme Cakeovers" including information on how to purchase it, as we get closer to the book's release. Stay tuned! 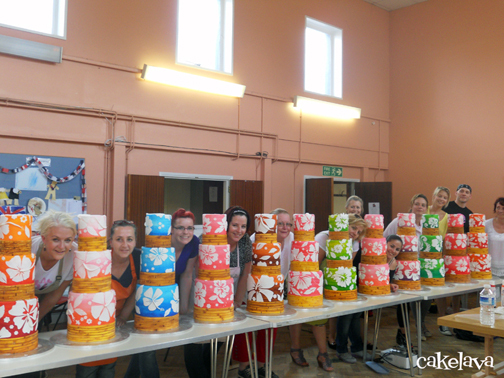 Less than a week after our book was launched by Clarkson Potter, we had visiting family in town, and a handful of days to spend with them before we flew to London, UK, for two "Discover Your Inner Artist" classes at Exotic Fantastic Cake Decorating School. It was a lovely class and we met new friends and many talented cake artists. Students flew in from all over Europe and we even had a student fly in from the Middle East to take the class. London was amazing, as a city it is hard to compare to, except for maybe New York City, which is one of our favorite places in the world! We did a small amount of touring around, as we had a tight schedule and needed to get back to Hawaii, and had only two weeks until our next travel adventure! No sooner had we arrived back in Hawaii, unpacked our bags, made a few cakes, then it was off on another trip for a class, this time to Allentown, PA. The Allentown class at Mother of Cakes Sugar and Cake Academy was Rick's first class in the United States, strangely enough, and it felt good to be on our home turf. The students were fabulous, and everyone was quite advanced, which seems to be pretty typical of our classes. The Pennsylvania class, like the other class had been announced about a year before we arrived and there was much anticipation to meet the students, who were also very excited! The students in the PA class came from all over the continental U.S. as well as Puerto Rico and Valencia, Spain. We even had a student join us from the Canada "Discover Your Inner Artist 2" class, which was a lot of fun. We're just launching the "Discover Your Inner Artist 3" 2013 classes and information will be posted soon! While we were on the East Coast, only an hour and a half away from New York City, we headed into Midtown to meet our publisher! We have been working for over a year with our editor and an amazing team of people at Clarkson Potter and had never met them face to face. Crazy! It was a visit long overdue! With only less than a full day to enjoy in Manhattan, we decided that if we do nothing else there, it will be worth it to meet everyone. Our publishing team gave us a warm welcome when we arrived and gifted us with a bunch of new cookbooks. We were on cloud nine. It was so special for us to be able to share in the excitement of our book with the people who made it possible! We want to thank our hosts, Exotic Fantastic and Mother of Cakes, for giving us the opportunity to teach there, and to all our students who have supported Rick's teaching career! It's great to be back in the swing of things once again! 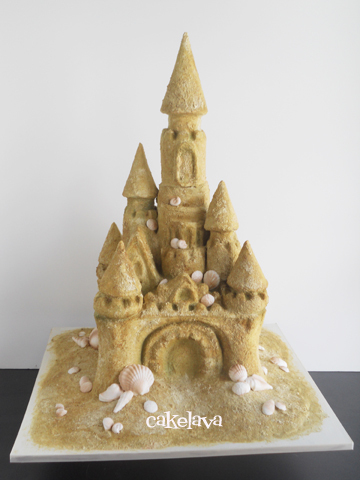 Now that the hard part of the book writing is behind us, we are able to focus more of our time towards making cakes. In the past couple of months we've had an opportunity to make some amazing cakes, some of which have been posted on our Facebook page. Thank you to everyone who has left us comments and sent us emails of appreciation, and apologies to anyone we had to turn away due to other commitments. 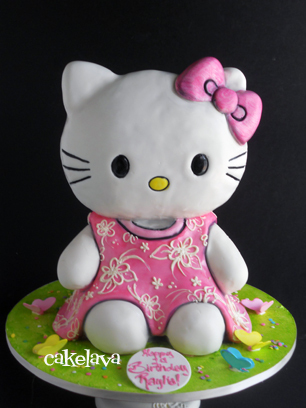 It's been a while since Rick made a sculpted Hello Kitty cake and we've been looking forward to this super cute version wearing a Hawaiian print sundress for months. The cake was made for the baby daughter of a couple whose wedding cake Rick made a few years ago. It's always a treat when a couple returns to us for their children's cakes. To be able to do one of our favorite characters in a new way makes it even better! The couple selected our yummy Guava cake for the inside of their sculpted cake. Pretty in Pink inside and out! Thank you to Delphine and Ray for including us in your sweet girl's special day!